The following information was written in Dutch by Ina and then translated by Paula Gerdes in January 2003. While the video clips are foreign ones, the visual aspect of both types of skills are easily discernible. When I was in Herpen at the school for Assistance Dogs (Stichting Hulphond Nederland), I told them that I would love to dance in my wheelchair but I couldn't find a partner. They said, "Why don't you see if you can dance somewhere with your assistant dog Yce?" I thought they were kidding me, but they weren't and they gave me some information about doggy dancing. 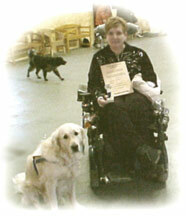 In September I made an appointment with the dog training school in Delft. 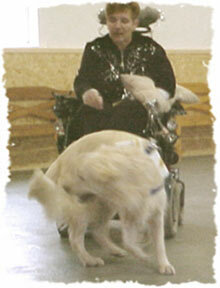 Marleen is the trainer who has taught able-bodied persons and their dogs doggy dance for years, but she never had a student in a wheelchair. Nevertheless, she was, just like me, very enthusiastic and together we looked into the matter. We worked very hard and I had individual lessons because almost all of the normal doggy dance steps were not suitable for a wheelchair. Marleen taught me how I could teach Yce a dance step, but I made up the steps and then taught them to Yce myself. Also I made notes on how to learn the steps and which order belonged to a particular dance step. When Yce knew twelve different dance steps, I began the most difficult part  selecting the music, etc. 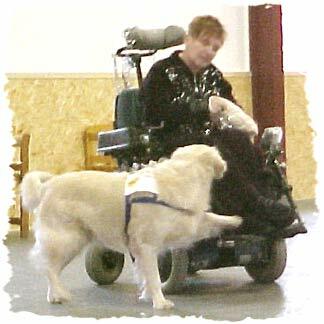 The nicest part of wheelchair doggy dancing is that you can practice in a small room, for instance in your living room. Also you keep working with your dog while you're teaching him new things and it's a lot of fun and relaxation. Yce loves to do it and when we arrive in Delft to train he is wild with joy. What do you need for wheelchair doggy dance? 1. 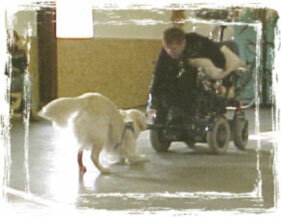 A dog training school with a hard floor, because wheelchair doggy dancing on the grass is impossible. 2. A dog trainer who likes a challenge. On December 15 I danced my first contest. There were ten contestants. I was the only one in a wheelchair, but everything went great and Yce and I won the third prize! I was so proud. The jury from Belgium never saw anyone in a wheelchair perform doggy dancing, their later inviting me for further contests in Belgium. One of the major TV stations also called after reading my article. They want to tape Yce and myself when we are training. If all goes well, this will happen on January 21. Check out a television news film clip of Ina and Yce during a freestyle class. And, be sure to also click here to see Yce showing off his incredible service dog skills during another wonderful television clip..